When "debunking" creationary material, anti-creationists use several tactics, but seldom employ reason, science, and logic. Ironically those are things they claim to uphold. Instead, they use logically fallacious arguments such as the straw man, loaded terminology, arbitrary assertions, poisoning the well, the red herring, outright lying, and their usual first resort, the ad hominem attack. (I believe most of their fallacies could be considered variations on the red herring diversion.) Something I've said for years is that respect must be earned, and such scheming moves their respect percentages into the negative numbers. One version of the red herring/ad hominem is the use of emotive terminology. Those of us who reject microbes-to-mocker evolution are often bushwhacked with speech-control labels such as "anti-science" (here, for example), or its ugly kid brother, "science denier". Those are based on the equivocation fallacy where those of us who reject universal common ancestor evolution and affirm special creation are essentially accused of being opposed to science itself. Perhaps they think that by using such wording, they can avoid the inconvenient truths of creation. Related to these epithets are "climate change denier", "homophobe", "racist", and others. They are only used to provoke negative emotions. While things like racism exist, the excessive use of such words tends to negate their effectiveness when the claims are legitimate. But "anti-science" or "science denier"? Listen up, pard: science is not an imperator nor a monolithic entity, and not many people are anti science, you savvy? 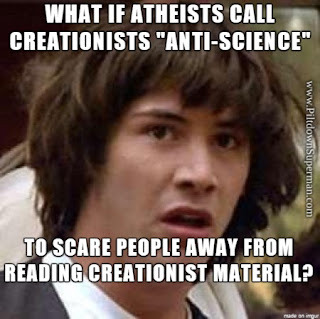 Another level of labeling is when creation science is referred to as "pseudoscience" peddling "junk science". 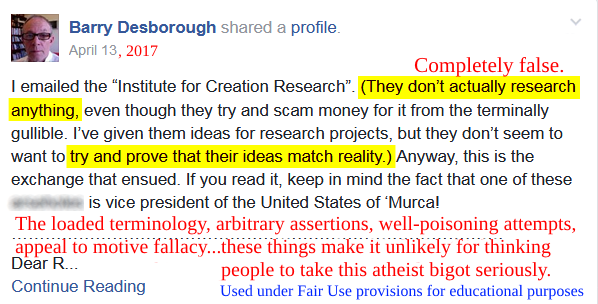 As I said earlier, anti-creationists are willing to lie for Darwin for their purposes. Interesting how the accusations of "pseudoscience" toward creationists are not only pusillanimous, but apply instead to evolution, which is the real pseudoscience! Just look at the way the human-chimpanzee genome similarity was faked. Efforts to slime creationists and other disbelievers in evolutionism are convenient ways of avoiding the facts and dealing with the implications: Earth is not nearly as old as they claim, and the evidence supports what God said in his Word. That means we'd better cowboy up and find out what he has to say. It is interesting that a major secular science publication is warning against the overuse of the expression "anti-science". More interesting is the way they use labels themselves and display their double standards. The world’s leading science journal warns its members to beware of the anti-science label. To finish reading, click on "Anti-Science Label Can Be Misused".